Jamiah Arabia Ahsan-Ul-Uloom by the grace of Allah subhan-wa-talah is providing considerable Islamic assistance. Shaikh-Ul-Hadith-Wa-Tafseer Hazrat Maulana Mufti Zar Wali Khan Sahib (D.B) established this jamiah in 1398 Hijra. The aim of the jamiah is to produce intellectual and endowed scholars capable of guiding entire Ummah on the precise pathway according to authentic teachings of Quran and Sunnah. Jamiah Arabia Ahsan-Ul-Uloom provides one of the most detailed and complete Dars-e-Nizami (i.e. Tafseer-Ul-Quran Al-Kareem, Dars-e-Hadith shareef, Fiqah, Islamic rulebooks, Arabic literature and more free of expenditure. Other than Islamic Education, Hifz and Nazrah Quran, Darjah-e-A'adadiyah i.e. (equivalent to eighth grade books including books with beginners Arabic, Farsi and other Islamic books) are also being taught. In the jamiah there is an exceptional layout of Darjaat-at-Takhasusat (Ph.D). Jamiah also has one of the most authentic Dar-Ul-Iftah of this decade which is responsible for solving queries related to day-to-day problems in the illumination of Islam with broad research and investigation under the management of Shaikh-Ul-Hadith-Wa-Tafseer Hazrat Maulana Mufti Zar Wali Khan sahib (D.B). 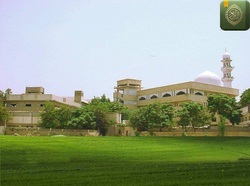 During usual vacations, outstanding planning for Daura-e-Tafseer-Ul-Quran Al-Kareem is organized in which men and women (in a very separate partition and with proper & absolute pardah) from all line of work attend regularly.Jamiah Arabia Ahsan-Ul-Uloom consists of more than thirty teachers/Ullemah most of which have their education from Dar-Ul-Uloom Deoband. Jamiah Arabia Ahsan-Ul-Uloom accommodates more than a thousand students from different regions of not only Pakistan but also from several other countries. Jamiah takes full dependability of student's daily needs including daily meal, health care, accommodation, essential clothes and their monthly gross. Musafahah literally means to join a hand with another hand. This can be done with both hands or with just one. Those who claim that it is sunnah to do musafahah with one hand should themselves produce a hadith in which [doing musafahah with] one hand is clearly mentioned. In fact, this is not enough. They should additionally prove that there exists a prohibition of performing musafahah with both hands. Without these two things, their claim cannot be substantiated. musafahah with two hands and Ibn Mas’ud (may Allah be pleased with him) would do so with just one. It is therefore obvious that both of Ibn Mas’ud’s (may Allah be pleased with him) hands would have also been clasping [the blessed hands of the Prophet (Allah bless him and give him peace)]. Even if it is accepted that only one of Ibn Mas’ud’s (may Allah be pleased with him) hands was clasping [the blessed hands of the Prophet (Allah bless him and give him peace)], then it is also obvious that the preferred action would be that of the blessed Prophet (may Allah bless him and give him peace). from the hadith fi’li (action or deed) of the blessed Prophet (may Allah bless him and give him peace) and the other from the hadith taqriri (tacit approval of the Prophet, may Allah bless him and give him peace). However, it is obvious that even though both actions are permissible, the action performed by the noble Prophet (May Allah bless him and give him peace) would still be preferred. And Allah knows best. predecessors). And Allah knows best. Al-Yawaqit al-Ghaliyah fi Tahqiq wa Takhrij al-Ahadith al-’Aliyah, (UK: Majlis Da’wat al-Haq, 1st Edition) Volume 1, p. 280-281.